New Year’s resolutions can be tough. Narrowing down all of your life improvement goals into a single, streamlined list of priorities is undoubtedly a daunting task. Even now, as we near the end of January, many are in need of inspiration for just how to go about it. Good news: the stars are here to help. 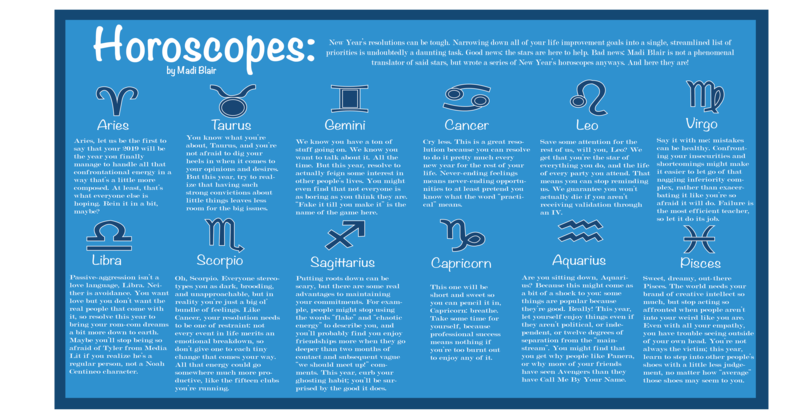 Bad news: I’m not a phenomenal translator of said stars, but wrote a series of New Year’s horoscopes anyway. Here they are! Let me be the first to say that 2019 will be the year you finally manage to handle all that confrontational energy in a way that’s a little more composed. At least, that’s what everyone else is hoping. Rein it in a bit, maybe? You know what you’re about, Taurus, and you’re not afraid to dig your heels in when it comes to your opinions and desires. But this year, try to realize that having such strong convictions about little things leaves less room for the big issues. Also, get out more. Your shows will always be there; your social calendar will not. We know you have a ton of stuff going on. We know you want to talk about it. All the time. But this year, resolve to actually feign some interest in other people’s lives. You might even find that not everyone is as boring as you think they are. “Fake it till you make it” is the name of the game here. Cry less. This is a great resolution because you can resolve to do it pretty much every new year for the rest of your life. Never-ending feelings means never-ending opportunities to at least pretend you know what the word “practical” means. Save some attention for the rest of us, will you, Leo? We get that you’re the star of everything you do, and the life of every party you attend. That means you can stop reminding us. We guarantee you won’t actually die if you aren’t receiving validation through an IV. Say it with me: mistakes can be healthy. Confronting your insecurities and shortcomings might make it easier to let go of that nagging inferiority complex. Failure is the most efficient teacher, so let it do its job. Passive-aggression isn’t a love language, Libra. Neither is avoidance. You want love but you don’t want the real people that come with it, so resolve this year to bring your rom-com dreams a bit more down to earth. Maybe you’ll stop being so afraid of Tyler from media literacy if you realize he’s a regular person, not a Noah Centineo character. Oh, Scorpio. Everyone stereotypes you as dark, brooding, and unapproachable, but in reality, you’re just a big ol’ bundle of feelings. Like Cancer, your resolution needs to be one of restraint: not every event in life merits an emotional breakdown. All that energy could go somewhere much more productive, like the 15 clubs you’re running. Putting roots down can be scary, but there are some real advantages to maintaining your commitments. For example, people might stop using the words “flake” and “chaotic energy” to describe you, and you’ll probably find that you enjoy friendships more when they go deeper than two months of contact and subsequent vague “we should meet up!” comments. This year, curb your ghosting habit; you’ll be surprised by the good it does. This one will be short and sweet so you can pencil it in. Breathe. Take some time for yourself, because professional success means nothing if you’re too burnt out to enjoy any of it. Sweet, dreamy, out-there Pisces. The world needs your brand of creative intellect so much, but stop acting so affronted when people aren’t into your weird like you are. Even with all your empathy, you have trouble seeing outside of your own head. You’re not always the victim; this year, learn to step into other people’s shoes with a little less judgement, no matter how “average” those shoes may seem to you.